Wouldn’t it be cool to give a Whale Watching Tour as a gift? Or maybe a Hot Air Balloon Ride? Even a nice Horseback Riding Lesson. Xperience Days is the country’s leading Unique Gifts, Adventure Gifts and Experience Gifts company, offers thousands of unique gift experiences nationwide. Right on the homepage you can search by the City, the Activity, or the Price. Can I tell you some of the ones that sound very intriguing to me? I know the exact person I would give an Experience Gift to! Do you? We’ve talked a lot lately on natural deodorant. I’m trying to drill it in your heads how important it is to stay away from antiperspirants! Have you ever heard of crystal deodorant? You may be asking What is the difference between them all? Naturally Fresh has a great page with some explanations on some facts you might like to know. 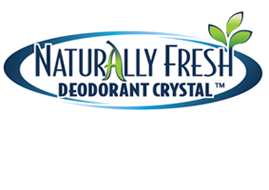 Here is a quick sum up of Crystals ~ The Naturally Fresh Deodorant Crystals are made of mineral salts which are pure and natural, fragrance free, non-staining and provide up to 24-hour, hypoallergenic protection against body and foot odor. The salt molecules provide a barrier of protection against odor causing bacteria from forming. The salt deposits stay on your skin, raising the PH level and stop bacteria in its tracks. One thing that I think is great about Naturally Fresh is the HUGE variety of product they carry! Everyone has their own preferences on what they like to wear ~ roll-on, stick, or spray-mist. The Roll-On & Spray comes in four new fragrances (or unscented) that are 100% Phthalate and Allergen Free, and 100% pure and natural. They are not sticky or greasy as you find many ‘regular’ deodorants to be. I have never actually used a Spray one before, but I was pleasantly surprised. You can spray on your arms or legs to give you a fresh feeling. This is especially good on those ‘I don’t have time to shower’ days! It is highly recommended by doctors–oncologists, dermatologists, and allergists! MoistStic ~ natural lip balm. It has a peppermint taste which is my favorite and really does tingle in your lips! Made with Tea Tree Oil, Vitamin E, Beeswax, Coconut Oil, Sunscreen (SPF 15) and Peppermint Oil. Foot Spray ~ I won’t say who needs this in our family, but it’s great to have a natural solution to spray into shoes and help solve that smelly problem! Crystals ~ totally wish I would have had this a couple of years ago when we had a long haired dog and couldn’t escape that ‘dog smell’. Use the Pet Crystal for any animal in any type of space! There is also a Crystal made for the Refrigerator! Or the original deodorant crystal you simply moisten with water and use! You can buy Online or at many retailers! Fragrance Free Roll-On is currently in all Walmarts across the country. It is easily the best value when it comes to the other natural deodorants on their store shelves at only $2.97 for a 3 oz. bottle. Plus, they are offering a $1.00 off coupon for all new Facebook fans! Naturally Fresh sent me samples for this review. I was not compensated in any way and all opinions are my own. This giveaway will end on Dec. 5, 2011 at midnight EST. Winners will be drawn via rafflecopter. Once a winner is drawn I will contact them and they will have 48 hours to reply before I draw a new winner. Giveaway is open to anyone in the US and you must be 18 years of age or older. Winner will be posted in the rafflecopter widget.